I don’t think she intended that phrase to become such a touchstone for me, but it’s had a huge impact on how I think about lessons and use my lesson time. For me, lessons have been an opportunity to bring the things I’m struggling with, or haven’t tried yet, or that seem complicated and challenging, and have expert help in coaching me through them. It had not occurred to me to show the instructor anything I’m doing well. But if I don’t, how will she have a full picture of where I am, and what I want to do next? If every piano lesson were about what you’re not good at yet, and you never get to just sit down and play some music that you love, you’re going to burn out. Musicians practice, rehearse and perform — and sometimes they get together and jam. It’s the jamming that brings out the most creativity, the relaxation, the connection and responsiveness. There’s a lot of laughing and not a lot of judging, in a good jam session. And yesterday, my private lesson with Erin did turn into something of a jam session. I took about 30 minutes to show Erin what I’ve been doing with Rocky and explained what I’m reading from him and what my plans are, and pretty much got the 100% YES in response. I’m reading him well, I’m seeing in his body where the pain is, and I’m providing what he needs physically, emotionally, and mentally. Then I got River out and without really thinking about the ticking clock of the lesson time, I just started playing with her at Liberty. I wasn’t really asking Erin questions or showing things I was just starting with. I just… played. At liberty. With my girl. At some point I became aware that Erin had gone to sit quietly on the mounting block and I got excited and started to talk about what I was doing. And the feedback I got was all “yes, I think you’re right” and “that looks good” and “your connection is perfect” and “she’s never abandoned by you, even when she’s out on the big circle” and even an “oh wow!” when River did teensy circles around me with perfect bend and flexion and total connection between the two of us. In the riding, I asked some detailed questions, and we decided that Erin should hop on River and feel it for herself and show me what she meant. She played with some patterns and narrated in her out-loud voice what she was sharing with River through her body. And I think River could tell, when I got back on, that I was trying to do the things Erin had been doing. 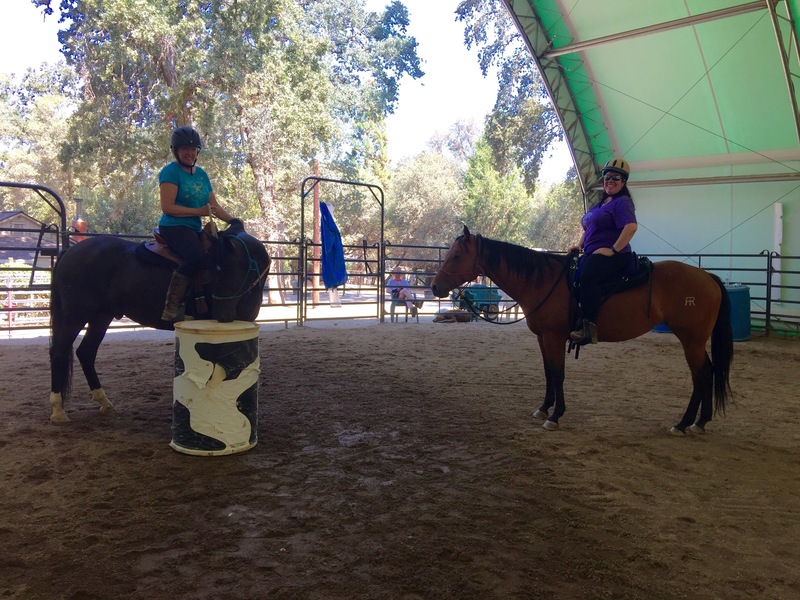 One of Barbara’s goals in our joint lessons has been to rekindle the fun and rebuild some confidence in the saddle. 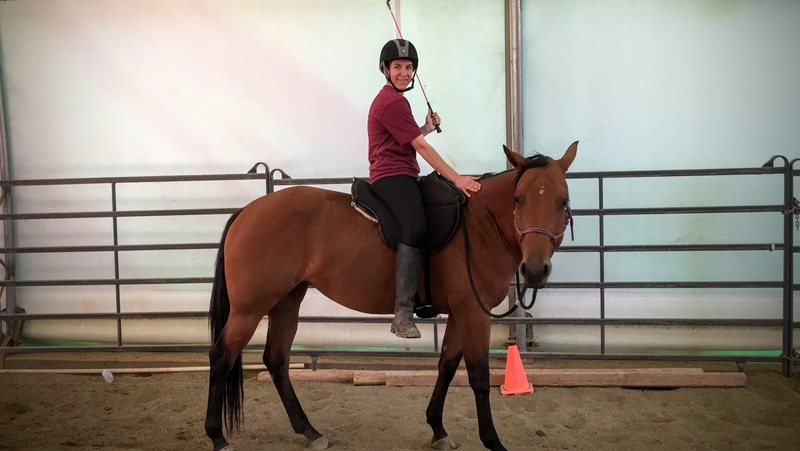 And part of doing that is remembering all the things that you already can do with skill and confidence, and allow yourself and your horse the chance to celebrate and play with all the progress you’ve made together. Doing that in the context of a lesson allows us to get creative and confirm that we’re doing the right things. 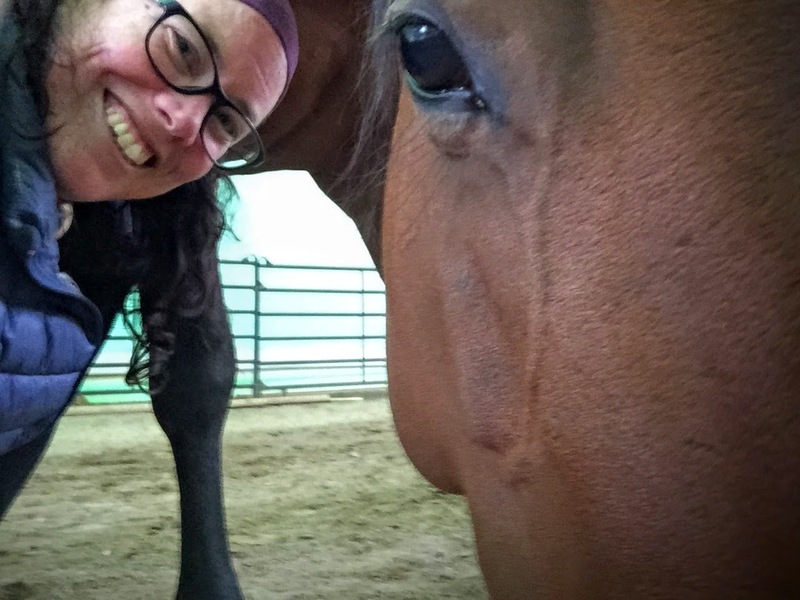 Why do you brand your horses? It is cruel, painful and unnecessary. Hi Aimee, I wouldn’t even know how to brand a horse. I bought my quarter horse when she was 2, and she was already branded. It’s a freeze-brand, not a hot-iron brand, so nowhere near as painful although I bet it itches like crazy for a few days, based on my own experience with liquid nitrogen. Also they did it under sedation — they do the vaccines, gelding, etc. at the same time — although given River’s temperament she probably didn’t need to be sedated for any of that (and of course she wasn’t gelded, heh).